Can Arun Sampanthavivat create a Chicago neighborhood from scratch? Arun Sampanthavivat and business partner Sunny Leon [left] stand outside Thai Town Center built from an old police station. The building will anchor what they hope will be a four block Thai and Asian neighborhood on the Northwest Side. When Arun Sampathavivat opened his acclaimed restaurant in 1985, he came to the project with multiple academic degrees, but zero culinary training. No matter. Within a few years, the budding chef would transform a drab Northwest Side corner of Kedzie Avenue into a world class dining destination, earning the industry’s highest accolades. Nearly 30 years later, the chef remains at the helm of his eponymous restaurant. But he&apos;s also rekindled his passions for literature and music. Over the past decade, Arun penned a 10-volume epic poem on the life of Buddha in classical literary Thai. He has also composed 80 songs and an operetta, despite a lack of formal musical training. This year, however, Arun hopes to launch his most ambitious project ever: creating a brand new ethnic neighborhood from scratch. He sees it eventually taking up four blocks of North Pulaski Road and he’s calling it Thai Town. Arun grew up as the oldest grandchild of a rubber plantation owning family in Southern Thailand. Although his main passion was literature, he gained an appreciation for food from meals with his Chinese grandfather and kitchen sessions with his Thai grandmother. While Arun wanted to study literature, his father demanded that his oldest son become a doctor. Today, with some shame, Arun admits that he purposely failed a science entrance exam in order to pursue his dreams. “I asked, if I couldn’t make it, he had to allow me to follow my own plan,” he recalled. “That is the first time I lied and I’ve felt miserable until today. But at least I could go on with my own plan." That plan involved studying in Germany, Japan and eventually at the University of Chicago. That’s where Arun was working toward his Ph.D. when two other Thai students asked him to help open a restaurant. When the others dropped out, Arun alone launched Chicago’s first fine dining Thai restaurant. It would eventually earn four stars from both Chicago newspapers, a James Beard award and top praise from dining guides and chefs around the world. A lesser known facet of Arun&apos;s accomplishments involves his work on a epic poem. Tracing the 10 lives of Buddha, the epic spanned thousands of pages and required countless hours of work, he says. But just as the chef was almost finished, tragedy struck. The massive poem isn’t the chef’s only artistic opus, however. About seven years ago, he says his mind was suddenly consumed with a series of melodies and lyrics that he couldn’t silence until he wrote them down. He says he emptied his brain of 80 songs and had 10 recorded as a sort of demo so he wouldn&apos;t forget how they sound. So far, Arun has shared them only with family and friends, but a few will make their public debut when Thai Town opens later this year or in early 2014. As we turn into the Thai Town parking lot, the chef points out a gold plated pedestal that will hold a statue of the Hindu god Prama the creator. The shrine to Prama brings an important Thai cultural element to the center which Arun hopes will unite what he sees as a fractured Thai community—and one that, for a long time, considered him aloof. “Once this is done, people will come to make an offering to the god or at least for something that is part of our culture and a way of daily life for the Thai people,” he said. Arun says that after almost 30 years, he’s grown weary of fine dining’s stress and expectations. In his new place, called Nagin, he’s looking forward to more freedom and even fun. He guides me through the remodeled police station where the old front desk is taking shape as a mini store and dumpling bar. He’s built large sunroom on the south side of the building giving diners views of the Prama shrine. Right across from the station&apos;s former shooting range, Arun plans to set up prep tables for large chef events. Upstairs, he plans a wellness center that will offer beauty treatments and Thai massage. And the former jail area? That, he says will be used to lock up food—after it’s cleaned for evil spirits. “We have to invite some important people to perform [in the jail area] whatever ceremony to make everyone feel good,” he said. As we march up and down the stairs of the unfinished center, I ask Arun where this project stands on the difficulty scale among all his previous ventures. After wading through years of delays, Arun is reluctant to promise a hard opening date for Thai Town. Still, his fingers are crossed for a launch by the end of the year. His big hope is that the pieces that follow won’t take nearly as long as this first city-sponsored anchor. 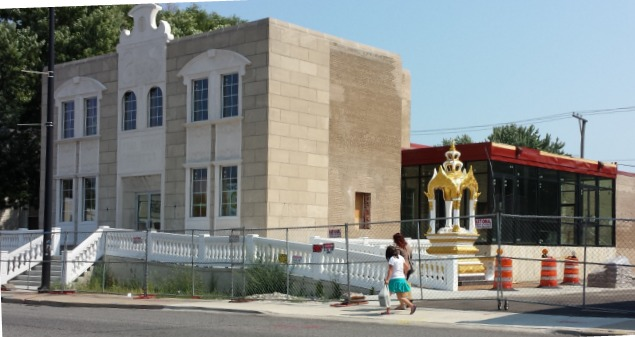 By the time he&apos;s finished, Arun sees Thai Town spanning several blocks of Pulaski Road and growing into a permanent fixture of Chicago. When you talk to the chef about the project, it&apos;s clear that the long delays have worn him down. But sometimes Thai Town also seems like a matter of survival for Arun—an existential quest for a man with no heirs, and for a son who sidestepped his father’s wishes to carve out a remarkable path of his own.